Colonel Chris Hadfield has spent decades training as an astronaut and has logged nearly 4000 hours in space. During this time he has broken into a Space Station with a Swiss army knife, disposed of a live snake while piloting a plane, and been temporarily blinded while clinging to the exterior of an orbiting spacecraft. The secret to Col. Hadfield's success-and survival-is an unconventional philosophy he learned at NASA: prepare for the worst-and enjoy every moment of it. 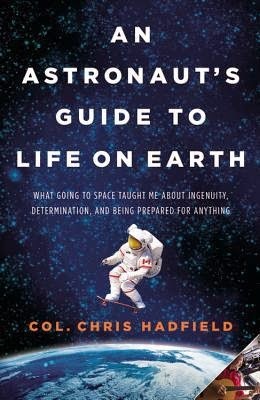 In An Astronaut's Guide to Life on Earth, Col. Hadfield takes readers deep into his years of training and space exploration to show how to make the impossible possible. Through eye-opening, entertaining stories filled with the adrenaline of launch, the mesmerizing wonder of spacewalks, and the measured, calm responses mandated by crises, he explains how conventional wisdom can get in the way of achievement-and happiness. His own extraordinary education in space has taught him some counterintuitive lessons: don't visualize success, do care what others think, and always sweat the small stuff. You might never be able to build a robot, pilot a spacecraft, make a music video or perform basic surgery in zero gravity like Col. Hadfield. But his vivid and refreshing insights will teach you how to think like an astronaut, and will change, completely, the way you view life on Earth-especially your own. This wasn't the book I was expecting. That's not to say I didn't enjoy it, but it was a lot more "self-help" than I realised it would be. Still it's an interesting story (the bits that are more story and auto-biographical) and he sounds like a guy who's without doubt had some incredible life experiences. And I think he did some amazing stuff education-wise and exposure-wise for life-in-space while he was on the ISS.